With National Girls and Women in Sports Day fast approaching on Feb. 6, Gopher Athletics has a weekend of celebration planned for six women’s sports events, including women’s hockey games. For this weekend, Feb. 2-3, fans can buy a ticket package that includes admission to Saturday’s women’s gymnastics meet, Sunday’s women’s basketball game, Saturday’s and Sunday’s tennis matches, and Saturday’s and Sunday’s women’s hockey series against Minnesota Duluth. The package also includes a Love Your Melon beanie. While Minnesota’s athletics department has celebrated National Girls and Women in Sports Day in the past and taken part in the statewide initiative, this is the first year the school is offering a coordinated ticket package across multiple sports. To gain some insight into the department’s National Girls and Women in Sports Day initiative, At Even Strength spoke to Mckenzie Lee, who works as a marketing coordinator in the athletics department. Lee has been heavily involved in planning the promotions and programming this year. At Saturday’s gymnastics meet, the team will host a post-meet press conference for kids to ask questions of their favorite gymnasts. 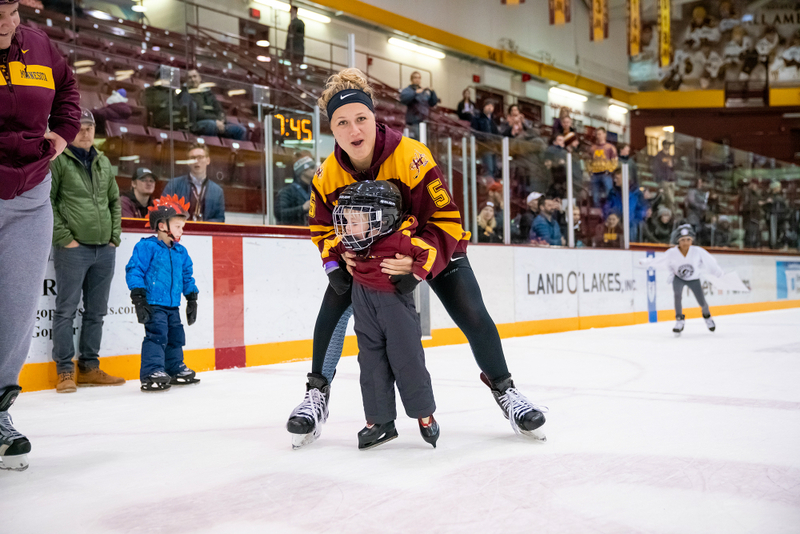 At Sunday’s women’s hockey game at Ridder, there will be a number of activities on the concourse for young fans to participate in, including a photo booth, inflatable hockey shot station, hopscotch, and a poster-making station. On the ice, the line-up buddies during player introductions, intermission games, and zamboni riders will all feature young girls. There will be a “girl power fan cam” on the video board throughout the game, as well as some student-athlete features in celebration of Black History Month. Minnesota’s women’s sports teams are steeped in success; it’s no secret that women’s hockey is a powerhouse program, and the rest of their women’s squads traditionally perform well in the Big 10 and across the country. Women’s volleyball earned a No. 2 seed in the NCAA Tournament this past fall and advanced to the Sweet Sixteen. Women’s soccer entered the Big 10 Tournament as the No. 7 seed and won the whole thing. Women’s hockey is ranked No. 2 nationally and split the season series with No. 1-ranked Wisconsin. Women’s gymnastics is ranked No. 21 in the country. Lee and her colleagues in the marketing department knew they wanted to showcase their women’s teams and all of their achievements, which is how the National Girls and Women in Sports Day initiative was born. It’s hard to ignore, though, that women’s sports are all too often deemed “not worthy” of investment, whether it be actual dollars and time, or through efforts like marketing. This argument, and talk around generating revenue, typically comes up in the context of professional leagues, but also applies at the collegiate level, where athletics departments and schools are always looking to balance the budget and reduce expenses without eliminating opportunities to bring in dollars. Marketing and promotions for women’s athletic events are standard, but dedicated programming created exclusively around women’s teams is a bit more than that: it’s a deliberate investment. It’s proven to be a sensible one, too. Lee noted that Minnesota’s women’s hockey team had a sold-out crowd of 3,400 people on hand when Wisconsin was in town two weeks ago. Lee has been with Gopher Athletics for a little less than two years. She has an event management background, and especially enjoys creating experiences that resonate with people long after they’ve left the building.